NBC 5 Investigates has uncovered records showing Dallas County schools gave several thousand dollars of taxpayer money to a charity run by the DCS Superintendent, Rick Sorrells. The donations raise new ethical concerns about the use of public funds at the school busing agency that’s in financial trouble. 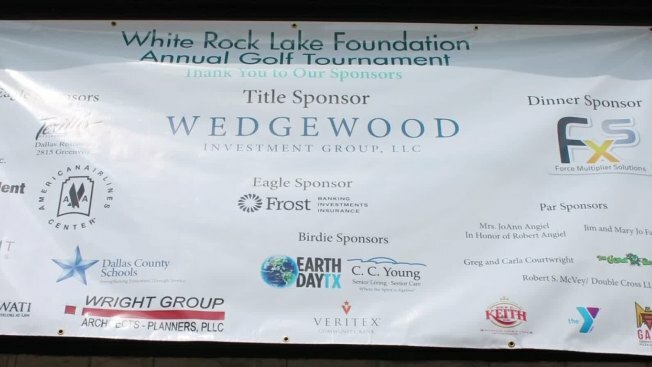 Expense records show DCS sponsored a golf tournament in 2015 for the White Rock Lake Foundation, a non-profit that helps support the White Rock Lake Park. The foundation’s website also listed DCS as a sponsor. The president of the foundation is Rick Sorrells, who is also the superintendent at DCS. Records show in all DCS has given the White Rock Lake Foundation more than $4,600 of taxpayer money since 2013. But when NBC 5 approached Sorrells at DCS headquarters on Wednesday, he didn’t seem to remember the donations made to the foundations when questioned. DCS records show Sorrells signed one expense report that included a DCS payment to the foundation in 2015. It shows, Sorrells assistant superintendent, Susan Falvo, used her DCS issued credit card to donate $900 for a “double eagle sponsorship” at the White Rock Lake Foundation’s annual golf tournament. Falvo is also the treasurer of the White Rock Lake Foundation according to the foundation's website. Photos on the foundation’s Facebook page show Falvo on the golf course at the 2016 tournament. The White Rock Lake Foundation’s website also shows DCS has sponsored the tournament three years in a row. And DCS check records show DCS wrote four checks to the foundation since 2013, including two for $1,000 each. "I would certainly be concerned about that, certainly from a perception perspective, it looks like there's some inappropriate dealing going on," said attorney Stephen Dubner. Dubner advises Texas school districts and says state law prohibits districts from gifting taxpayer money to private groups like non-profits unless the school board can prove the donation benefited the public. "It can't just be we want to do it - there has to be some benefit the school district is getting in return, otherwise it's a gift of public funds which is prohibited by the Texas constitution," said Dubner. For several months, NBC 5 has been trying to speak with Sorrells on camera about a number of financial and safety issues at DCS, but Sorrells has declined requests for an interview. On Wednesday evening, NBC 5 approached Sorrells at DCS headquarters to ask how the donations to his foundation were an appropriate use of taxpayer money. Sorrells said he’d have to check with Falvo about the expenses and said he was working with his public relations people and would meet NBC 5 later for a formal interview. When asked why he wouldn’t talk about the issue, Sorrells responded, "I will, I will, Scott. That's what I said about this. I've talked to our PR people and I will visit with you." Sorrells has not contacted NBC 5 since to set up an interview. But Thursday afternoon, he sent a statement saying, "These charitable contributions are legal and were made to create and develop relationships within the myriad communities we serve as well as increase our presence within those communities. It is a common practice with public institutions throughout the city and state." More photos from the 2016 White Rock Lake Foundation golf tournament raise other questions about conflict of interest. A photo of a banner listing the sponsors shows Force Multiplier Solutions was the tournament’s dinner sponsor. Force Multiplier Solutions is the school bus camera vendor DCS has paid more than $53 million on since 2009. Spending on a camera program that’s now been blamed for contributing to financial troubles at DCS. Photos from the White Rock Lake Foundation’s Facebook page show Force Multiplier’s CEO, Robert Leonard, at another White Rock Lake Foundation event in 2014, along with DCS board president, Larry Duncan. Last week, NBC 5 Investigates reported Duncan accepted more than $245,000 in campaign contributions from Leonard and others tied to Force Multiplier Solutions. All of this teeing up more questions about ethics and taxpayer money benefiting a private group run by the man in charge of a public agency. "Certainly on the outside, it just doesn't look right," said Dubner. NBC 5 tried to reach assistant superintendent, Susan Falvo, for comment today and learned she’s been laid off. DCS has cut more than 90 staff members because of the budget troubles. Falvo’s purchase card records show her card was also used to give thousands of dollars of taxpayer money to her community groups, too. That includes donations and membership dues paid to a local chamber of commerce where Falvo serves on the advisory board and previously served on the board of directors.